The one thing that makes backpacks great (they’re always out of the way) is also the one thing that makes them annoying when you need something. Paul Vierthaler agrees, and has come up with a rather clever solution called the Paxis that makes it easy to access some of your stuff. The Paxis is worn like a regular backpack, but features two main compartments. The top one is where you put all the stuff you probably won’t regularly need, like a few extra layers of clothing if you’re out for a hike. While the bottom is reserved for things you want quick access to, like your phone, or binoculars, or snacks. 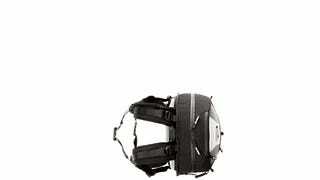 To make it easy to access that lower compartment without having to take off the entire pack, it’s mounted to an articulated arm allowing you to swing it around to the front of your body, grab what you need, and then just as easily swing it back where it automatically locks back into place. Available in different colors and 18-liter or 22-liter sizes that range in price from $240 up to $275, the Paxis pack solves the biggest gripe most people have with carrying a backpack—save for having to take it off when you step onto a crowded subway. But assuming that swing arm is strong enough, we might not be the only ones who see this as the perfect portable standing desk for an ultralight laptop? Why waste your time texting and walking when you can be working on spreadsheets or PowerPoint presentations instead?